It was revealed back in April that poker pro David Williams would be a contestant on the seventh season of “MasterChef.” In addition to the celebrity gained, Williams, who joined the growing list of poker players with reality TV exposure, was vying for the $250,000 grand prize and a cookbook deal. Williams finished runner-up in the 2004 World Series of Poker main event to Greg Raymer, pocketing $3.5 million. Williams has $8.5 million in lifetime tournament earnings. He earned a gold bracelet in a 2006 seven-card stud event. At the 2016 WSOP, Williams cashed twice prior to the start of the no-limit hold’em championship. The first came in a $1,000 no-limit hold’em in early June, and the next one, a 12th-place finish in a $1,500 no-limit hold’em, came later last month. Williams, who lives in Las Vegas, was one of six Las Vegans to be on this season of MasterChef, which airs Wednesdays at 8 p.m EST on FOX. Card Player caught up with Williams on Monday during day 1C of the main event to ask about how MasterChef compares to poker. 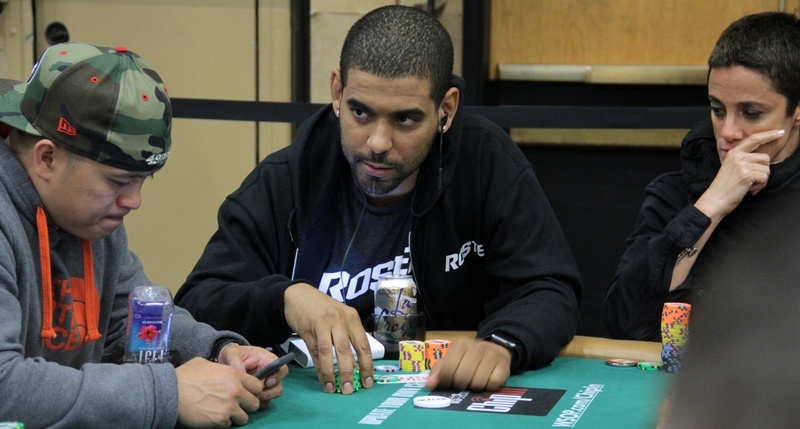 Williams ended up advancing to day 2 with a chip stack of 42,500. The main event starting stack this year was 50,000. Brian Pempus: What’s better these days: your poker game or your cooking game? David Williams: Definitely poker game. I’ve been playing poker for a lot longer; I’ve only been cooking for a few years. Poker is natural to me. BP: You said in a blog post about MasterChef that there was a good bit of pressure under the lights, in front of the judges. Did poker help prepare you for that? DW: Yeah, definitely. I had a huge advantage over the other competitors coming from a poker background. The pressure of poker dwarfs the pressure of MasterChef. To me, it just was cooking in front of some people with cameras. I think for some of the other competitors they never had experienced anything like that before, so it was probably tougher for them. BP: It looks like you have been having fun at your day 1C table. You wrote on Twitter that there was a lot of talk and no tanking and it felt like 2005. DW: Yeah, I just picked an old year back when poker was good [to compare it to]. At this table, we all introduced our names and were just talking, chatting, laughing, showing cards. It was just a very friendly atmosphere. No stare downs. I’m happy I’m at this table. BP: Is this the way poker should be played in your opinion? DW: Yeah, it definitely reminds me of the old days. The people here who aren’t professionals are enjoying themselves to the point where even if they lose, they’ll have a good time and want to come back. That’s what poker is all about. BP: I saw that you have Josh Arieh, who we all know finished third in the 2004 main event, rooting for you to do well on MasterChef. There was that famous confrontation between the two of you on the ESPN broadcast. DW: Josh and I have been close friends ever since actually. After I beat him in that one pot with the pocket fives, we kind of made up. When I got heads-up versus Raymer he was rooting for me. There is that infamous scene where he whispers in my ear “good luck” in not so nice words, but we have been close for 12 years now. BP: Have you received a lot of support from the poker community during your time on the show? DW: Oh yeah, the poker community has been amazing. Most people want to ask me how I did, but they don’t realize I’m not allowed to say. So I haven’t told anyone obviously. A lot of people watch and talk about it, which is cool. BP: Is the main event bracelet still a bigger deal for you than a MasterChef title? DW: The MasterChef trophy is prestigious, but the main event titles comes with a nice seven-figure payday (laughs). I gotta say, I would take that. MasterChef would be an equal accomplishment as winning my WSOP bracelet, but there’s nothing else like the main event. BP: How much of getting into your opponents’ heads was there on MasterChef? DW: It’s mostly focusing on what you are making, but there are strategic decisions in there: who to save and who not to save. You need to take risks when making your dish, so there’s a lot of gaming and strategy involved. BP: Is the MasterChef prize money that important or is it more the attention and the learning experience? DW: Yeah, the prize money on MasterChef doesn’t mean anything to me. The $250,000 is a lot of money, but compared to poker prize pools it’s nothing. I was just there for the notoriety, the accomplishment, putting myself in the fire, and testing myself.